Amazing place to stay, booked a night and ended up staying 3. Tri and Nou are the friendliest and caring guests. Properly look after you. Rooms are spacious and beds are proper comfy. Perfect location, more love Al then touristy. Tri and his brother Micheal do a fab easyrider tour. Highly recommend. Would go back in a heartbeat. We cannot say enough about this place!! The room was big, the bed was comfortable, the shower was warm, the food was delicious and the hosts were incredible!! Honestly, after spending a month traveling without Vietnam, Cam Ly was our favorite place that we stayed. Tree, his wife and their boys are so accommodating and want to make your stay in Da Lat perfect. We originally booked for 2 nights and stayed for 4. It was such a lovely, comfortable place to stay that we would highly recommend it!! Great location with very accomodating hosts. Highly recommend this place. 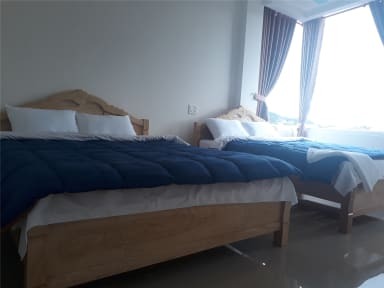 This is a lovely homestay with beautiful views around Dalat. The whole family was welcoming and helpful. The facilities were clean and comfortable. We booked the Easyrider tour through the owner and had so much fun. Tri and his wife are the hostess with the mostest. Went above and beyond in every way imaginable. BIG room, BIG comfy clean bed, clean bathroom. Amazing view out our window. His wife made us breakfast in the am and brewed coffee using beans freshly grown by her mom, Trip and his brother took us on an epic motorbike ride around Da Lat hitting all the highlights. Walking distance to Crazy House in 5 minutes. Favorite place to stay in southeast Asia by far! The hosts are fantastic, the husband is a very funny and knowledgable guy and the wife is also very helpful and sweet (sorry I forgot your names, but thank you for everything, we loved our time at your home!!) We had a very large, clean, and comfortable room. Location was central. Moterbike rental was available from the home, which was very convenient. The home was also situated on a hilltop providing a breathtaking view! 10/10 would recommend!! I’ve stayed in quite many hostels, and it’s safe to say that this is my favourite! The family running it makes the entire place! They are the nicest and most accommodating people I’ve met in Asia. In addition to the amazing staff, the beds are comfortable, the facilities are good and clean, and the location is perfect as it’s quiet, but still not far from the city center. Da Lat is also a fantastic city, so far my favorite in Asia after two months of traveling! Lovely little homestay just off the centre of Da Lat. You can easily walk to town in 15-20 minutes. The family were delightful and bent over backwards to be helpful. I booked the canyoning here which worth splashing out for. The bathroom for the dorm was clean and worked fine, though a little small. 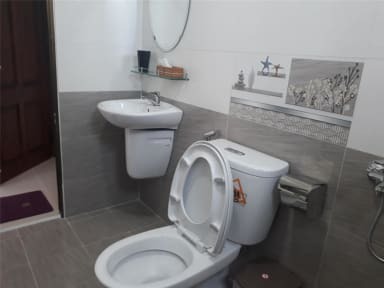 The private rooms have nice en-suites. Have to walk up a very steep hill to get to. Friendly welcoming and helpful. Clean but whilst we stayed our room wasn’t cleaned so didn’t get new towels etc. Very noisy at night as the family congregate downstairs and our room was just above them so we didn’t have the early night we had planned! Wouldn’t stay here if you wanted a sociable place. Overall, nice enough.